Wanna feel the spirit of Belgrade? 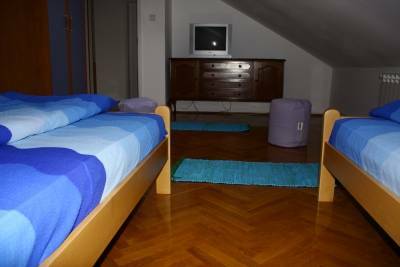 Our hostel is perfect for those looking for a relaxed and quiet stay in Belgrade. We offer private accommodation in double room and 5, 6 and 8-bed dormitory, chill out room for all guest and wonderful garden with baldachin and barbecue. For all those who will appreciate the most central location in Belgrade, impeccable cleanliness and safety, very comfortable beds the highest level of security, fast and stable WI-Fi in all rooms, air-conditioning during hot summer days. Two floors of modern, budget accommodation just five minutes walk from Knez Mihajlova Street ( main pederstrian zone ) and Square of the Republic ( central city square ). The perfect place for young backpackers, businessmans, travelers, groups or friends wanting to experience the heart of the capital. We're within very easy reach of Kalemegdan, old and new castle, Skadarska street (old bohemian quarter ), Strahinjica Bana street ( bar street ), Delta city and Usce, so great shopping opportunities, restaurants and entertainment await you. * Garden with baldachin and barbecue. Our moto is: A stay in affordable accommodation doesn't have to mean a sacrifice in quality. We look forward to helping your journey be the best it can be! The rooms are new, comfortable, furnished with new beds. Each bed has a locker key. All rooms are air conditioned and have free WiFi. We are located 2 minutes walk from the Square Slavija. Slavia Square is the largest square in Belgrade. Temple of Saint Sava is located 5 minutes walk from our hostel. Nearby is Vukov Monument (monument dedicated to the creator of our letter) and there is also a local subway station. 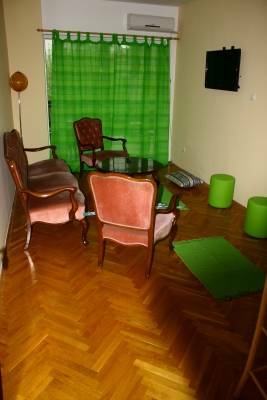 2 minutes walk from the hostel there are technical colleges, student cultural center, the main Belgrade streets. Immediately opposite the hostel, there are Spanish Embassy and the Museum Nikolea Tesla. 10 minutes from the hostel is located in Knez Mihailova street (main pedestrian zone), Republic Square, Kalemegdan (old and new fortress ), Skadarska Street (bohemian quarter ) and Strahinjica Bana Street ( bar street ). Cash deposit required upon booking. In case of cancellation, then you need to cancel at least 7 days before arrival. If the reservation is not canceled in time, the hostel reserves the right to charge one night. Go out throught the main exit, and go straight up through the street of Nemanjina (ciryllic - Немањина), it is a wide street where trams are going. Then go straight up for 5 minutes, till you come to the Square Slavija. Now you are at big round cross-road. When you get to big round cross-road, go left at the Beogradska street, it is a wide street with trams and buses going through, and then go straight up for 2 minutes, and take the second right into Krunska street. Only 10 meters ahead of the Spanish embassy and streets Prote Mateja. So, now you are in the street of Prote Mateje, and Hostel Eldorado is just 20 meters on your right side, at number 46. Go out throught the main exit, and just on your left side is a tram station. Take the tram No. 2, No. 9 or No. 12 and go out next stop. Now you are at big round cross-road. When you get to big round cross-road, go left at the Beogradska street, it is a wide street with trams and buses going through, and then go straight up for 2 minutes, and take the second right into Krunska street. Only 10 meters ahead of the Spanish embassy and streets Prote Mateja. So, now you are in the street of Prote Mateje, and Hostel Eldorado is just 20 meters on your right side, at number 46. From bus station - first go to the main train station. Follow our map to find the train station (about 2 minutes): walk through the little park right where you got off, and follow the main street 400 hundred meters until you see the main train station (big yellow building) on your right. From there, follow the way from the main train station. Or You can take a taxi, and the price of the ride will not be more than 300 dinars, (about 4 euro) to the street of Prote Mateje No 46. From airport - You can take a JAT bus (a price of the ticket is about 2 euro), which goes directly to the center of the city, and get off at the last stop - Slavija. Now you are at big round cross-road. Hostel Eldorado is 3 minutes walk from the bus stop, through the Beogradska street, which begining is from the round cross-road. From there, follow the way from the main train station. * Taxi from the airport costs around 1000 dinars (11, 5 euro) If you have decide to go by taxi, ask for the price before you take one! * The whole way to the hostel, when you are in the city, is a very short one, but make sure you’ve printed these directions out and have our little map handy too. If in doubt at any point, give us a call or send us an SMS, and we’ll help you. Or contact us and we will pick you up for a small price. Go out throught the main exit, and just on your left side is a tram station. Take the tram No. 2, No. 9 or No. 12 and go out next stop. Now you are at big round cross-road. When you get to big round cross-road, go left at the Beogradska street, it is a wide street with trams and buses going through, and then go straight up for 2 minutes, and take the second right into Krunska street. Only 10 meters ahead of the Spanish abasada and streets Prote Mateja. So, now you are in the street of Prote Mateje, and Hostel Eldorado is just 20 meters on your right side, at number 46. Nearest airport: From airport - You can take a JAT bus (a price of the ticket is about 2 euro), which goes directly to the center of the city, and get off at the last stop - Slavija. Now you are at big round cross-road. Hostel Eldorado is 3 minutes walk from the bus stop.